The Allmusic review by Scott Yanow states: "This CD is often magical. Sonny Rollins, one of jazz's great tenors, is heard at his peak... Not only did Rollins have a very distinctive sound, but his use of time, his sly wit, and his boppish but unpredictable style were completely his own by 1957." Music critic Robert Christgau highly praised the album, writing: "Rollins is charged with venturing far out from these tunes without severing the harmonic moorings normally secured by a piano. He does it again and again – but not without a certain cost in ebullience, texture, and fullness of breath. Impressive always, fun in passing, his improvisations are what avant-garde jazz is for." The album was identified by Scott Yanow in his Allmusic essay "Hard Bop" as one of the 17 Essential Hard Bop Recordings. The Penguin Guide to Jazz gave it a maximum four stars plus crown, concluding that "these are record[ing]s which demand a place in any collection". 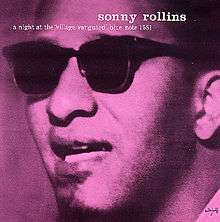 ↑ Bailey, C. Michael (August 10, 2005), "Sonny Rollins: A Night At The Village Vanguard" All About Jazz. 1 2 Yanow, Scott. "A Night at the Village Vanguard > Review". Allmusic. Retrieved June 26, 2011. 1 2 Christgau, Robert. "A Night at the Village Vanguard > Review". Robert Christgau. Archived from the original on 6 June 2011. Retrieved June 26, 2011. ↑ Yanow, Scott (November 2, 2010). "Hard Bop (Essay)". Allmusic. Retrieved 2012-08-24. 1 2 Cook, Richard and Brian Morton (2008), The Penguin Guide to Jazz Recordings (9th edn.) Penguin, p. 1233.